We all have seen bad traffic jams and have been also annoyed while being stuck in them. But have you ever driven really slowly because few lions were chilling on the main road? We guess not! Well, something similar has happened in South Africa recently and we are amazed. A video is going viral on the internet showing four fully grown lions walking on the road and cars follow them slowly without disturbing them. The half-a minute-long video shot at the Kruger National Park in South Africa was first shared by a Facebook page ‘Lions of Kruger Park And Sabi Sand’ and has got millions of views and shocking comments. 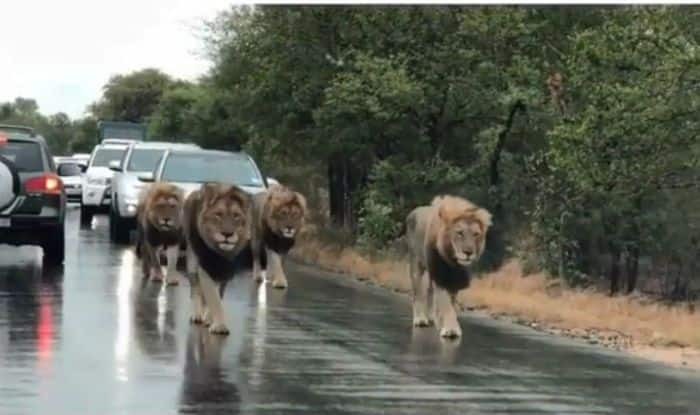 In the video, four majestic lions take over the busy road and the cars on the road are seen slowing down and moving behind the lions. The video has received more than 36,000 shares and 1.7K comments. The people on social media are awestruck and some have compared the video to wild vs Man where wild is defiantly being on the top of the man.